Habit: Plant stout, +- glabrous, except inflorescence minutely strigose or glandular-hairy; rosette well developed. Stem: 5--20(30) cm. Leaf: 25--100(130) mm, generally lanceolate to oblanceolate, +- entire to minutely dentate. Inflorescence: bracts inconspicuous. Fruit: 2--3.8 mm wide, curved outward. Ecology: Sandy slopes, washes, desert scrub; Elevation: -70--1200 m. Bioregional Distribution: D; Distribution Outside California: to southern Utah, western Arizona, northwestern Mexico. Flowering Time: Feb--May Note: Intergrades widely with Eremothera boothii subsp. desertorum. 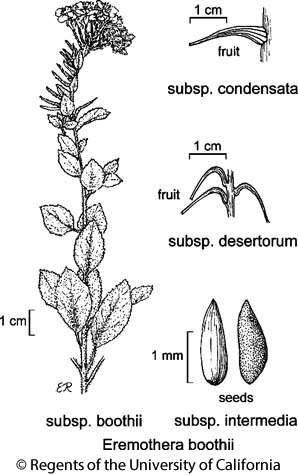 Citation for this treatment: Warren L. Wagner 2012, Eremothera boothii subsp. condensata, in Jepson Flora Project (eds.) Jepson eFlora, http://ucjeps.berkeley.edu/eflora/eflora_display.php?tid=89262, accessed on April 24, 2019.